The Atmos Kiln RA Kit is an updated version of Atmos' original Kiln Kit vaporizer, now with replaceable atomizers for an expanded lifespan. As the original, the Kiln RA Kit features a deep ceramic heating chamber with pure ceramic heating element, this provides one of the cleanest and most flavorful vapor qualities possible while also ensuring an extremely efficient vape method. These ceramic disc atomizers feature a two post design that can be quickly and easily removed using the included screw driver, this allows you to purchase a number of replacement atomizers separately to keep your new Kiln RA vaporizer working like new for much time to comes. A 650mAh lithium ion battery powers the Kiln RA's heating element, leaving you with an extremely long lasting battery that will provide a long life span between each charge as vaporizing concentrates takes very little power compared to dry blend vaporizers. 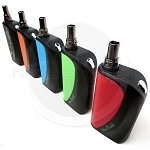 This battery utilizes a one button operation that makes vaping as simple as can be and a convenient micro usb charging method with pass through charging function allows you to continue vaping while charging. Atmos also includes a stainless steel hand tool to aid in the filling process as well as a set of replacement screws and o-rings to ensure your Kiln RA remains working like new even if you are to lose these necessary parts.